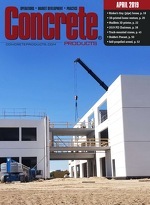 A newly formed parent company, Afinitas, encompasses a charter dry cast equipment business, HawkeyePedershaab Concrete Technologies, plus three other manufacturers acquired over the past 18 months: New Hampton Metal Fabrication Corp., New Hampton, Iowa; BFS Betonfertigteilesysteme GmbH, Blaubeuren, Germany; and, CAM Sales Inc., Ludington, Mich. The name Afinitas derives from the Latin word for alliance, underscoring both the lasting relationships between each company and its customers, as well as the synergistic potential unleashed through their alignment. More than 350 team members in eight global locations are part of the growing, infrastructure market-center Afinitas platform, which currently has three divisions, each with distinct brands, capabilities and leadership teams: HawkeyePedershaab and BFS (dry-cast equipment), New Hampton Metal Fab (wet-cast forming), and CAM Sales (consumables).